The papers, from the probe into Jean Charles de Menezes' death, and leaked to ITV, suggest he was restrained before being shot eight times. Mr de Menezes, 27, was killed at Stockwell Tube station on 22 July. The Independent Police Complaints Commission (IPCC) has said it will not comment on its investigation. The documents, including witness statements, also suggest Mr de Menezes did not hurdle the barrier at Stockwell tube station and was not wearing a padded jacket that could have concealed a bomb, as eyewitness reports previously suggested. The family of Mr de Menezes has called for a public inquiry into his death. His cousin Allessandro Pereira said: "My family deserve the full truth about his murder. The truth cannot be hidden any longer. It has to be made public." He said the police should have stopped his cousin before he got to the bus stop after leaving home in Tulse Hill. "He would have helped the police," he said. "They killed my cousin, they could kill anyone, any English person." 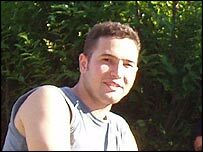 In a statement, the IPCC said it does not know where the documents came from and that its priority was to keep Mr de Menezes family informed. 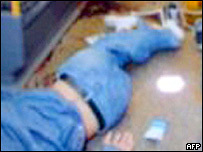 The shooting occurred the day after the failed bomb attacks of 21 July. The latest documents suggest Mr de Menezes had walked into Stockwell Tube station, picked up a free newspaper, walked through ticket barriers, had started to run when he saw a train arriving and was sitting down in a train when he was shot. In the immediate aftermath of the incident, police said Mr de Menezes had been acting suspiciously. Despite the eyewitness reports that Mr Menezes had worn a large winter-style coat, the leaked version suggested he had in fact worn a denim jacket. The leaked version said Mr de Menezes was being restrained by a community officer when he was shot by armed police. The IPCC would not comment on the details of the leak. What sort of society are we living in where we can execute suspects? The commission said the family "will clearly be distressed that they have received information on television concerning his death". Its statement added: "The IPCC made it clear that we would not speculate or release partial information about the investigation, and that others should not do so. That remains the case." The commission said it operated a "very high degree of security" on all of its investigations. Harriet Wistrich, solicitor for the family of Mr de Menezes, said the information the leaked documents contained was "terrifying". She urged the government and police to review the shoot-to-kill policy. "What sort of society are we living in where we can execute suspects?" she said. "First of all it tells us that the information that was first put out, which was first reported in the news, is almost entirely wrong and misleading. She said it also suggested the information given to the pathologist who carried out the post-mortem examination on Mr de Menezes was incorrect. Former Flying Squad commander John O'Connor told the BBC the leaked report would cause "great embarrassment" to Metropolitan Police Commissioner Sir Ian Blair, adding he would be under pressure to "go". He also said it was "very difficult" to blame individuals for the death of Mr de Menezes. "Simply because it would appear that they were acting on information that this was a positive identification of Osman [Hussain], one of the suspect bombers. "But had the normal procedures taken place in which a warning is given and officers wear specially marked clothing then this young man may not have been killed." Scotland Yard and the Home Office have so far said it would be inappropriate to comment.